Where would you go to survive a deadly pandemic? An unstoppable virus. Humanity’s last stand has failed. In the aftermath of a devastating flu outbreak, what would you do to stay alive? "Mad Max meets The Last Ship", "Terrifyingly realistic", "A perfect blend of science fiction, history and social commentary." If you enjoy fast-paced, post-apocalyptic stories such as The Passage, The Road, Station Eleven, The Stand, and The Atlantis Gene, you'll love The Hurst Chronicles series that weaves together history, science and social commentary in a dark, dystopian page-turner. Robin Crumby is an author and writer living in London with his wife and two children. Since reading John Wyndham's Day of the Triffids as a child, he became fascinated by end of the world dystopian literature. More recently, re-reading Cormac McCarthy's The Road and Emily St. John Mandel's Station Eleven inspired him to start writing. Why? Because post-apocalyptic fiction fires the imagination like nothing else. Pondering what comes next, who would survive, what would life look like? Much of the best fiction in this popular genre focuses on brain-eating zombies or events unfolding in the USA so Robin determined to write a story set in the UK. His Eureka moment came wandering the shingle beach at Milford-on-sea, inspired by the beauty and rich history of the Solent. Where better to survive the end of the world than a medieval castle surrounded by water? 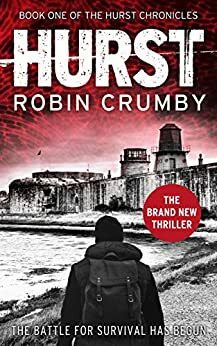 Robin spent much of his childhood messing about in boats, exploring the many waterways, ports and military forts of the Isle of Wight, where The Hurst Chronicles are set. Rambling plot, mismatched words, and thin characters make this post-apocalypse book just another for the heap. It’s not horrible, but it’s not good, either. The story picks up toward the end and then just rambles to a wheezing end. Pick it up for a buck if you need a PA fix, but don’t pay full price. I really loved this book, it has a different take on the Apocalypse or maybe it was the area that I enjoyed so much. The characters are well written , a couple I am not too fond of! Like Briggs and Copper, still not sure of Terra yet. But Jack, Riley and Will, who I feel so bad for (Will) because of the attack on the castle. If you are debating if you should read this as book, do so, you won't be sorry. I am looking forward to reading the next book. This actually showed up in my Facebook feed, and on the off chance I ordered it. The narrative is surprisingly good. The character development was very interesting, and the writing was skilled and interestingly driven. I wasn’t terribly keen in that book ended with a nod to its sequel, but the story itself kept me engaged, the characters were well formed, and the pace of action definitely kept me interested. The story itself is completely plausible, and I very much appreciated the fact that the author had done research on the actual historical sites that then made the text all the more interesting. If you like Apocalyptic genre stories, then I would recommend this text highly. I have ordered the second and third texts in the series, because I was so intrigued by the first book. This was an exciting, fast moving book. It :-) the makings of van interesting series. The author, Robin Crumby seem to be a really thoughtful, polished author.